Alabama three piece, The Sunshine Factory posed me a bit of a problem whilst reviewing. 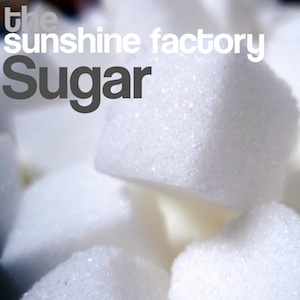 In part, their album, Sugar, borrows so heavily from My Bloody Valentine it’s difficult to not call them a tribute act. Not to be unkind, as their borrowing is sometimes so faithful it’s a tribute to their musicianship. So, for the purposes of this review I’ll try not to mention it again. Opener, ‘Down’ chimes in and gets down to business. Breathy melodic opening bars with wonky backing riffs plunge into chorus and brash guitar solos. Considering every frequency is used, it’s surprisingly light. Tempo throughout is nonchalant plod, and the accent is very much bored-art-school-snarl. ‘Smile’ brings a more psychedelic edge. It’s a hard, rock n’ roll track with boy-girl vocals. The chorus comes with a solid guitar riff even Primal Scream would be proud of. ‘Dont Fall Asleep’ has a more electric charm, with more wonky riffs on offer. It’s an engaging piece of dream-pop with great chord changes and vocals pitched just right. ‘Twisted and Clover’ is probably the stand out track. Sounding somewhere between The Boo Radleys and Chapterhouse, it’s right up my street. This is where The Sunshine Factory strike a good balance between their obvious love of their shoe-gaze heroes, and what emerges as their own sound. Wonky backing track is minimised to give way to clashing guitars. This is probably where they work best; mid-tempo and distorted, but with a greater sense of [good old fashioned] rock n’ roll. You get the impression if you stripped away the effects they would still have some solid tunes. I do like their love for distorted guitars and their ability to fill every frequency with sound. The Sunshine Factory sound like an accomplished band even on their first outing. Sugar proves to showcase a number of their talents, but still feels a little disjointed as a complete record. I would like to see them drop the effects pedals occasionally and have faith in the band lurking beneath. This entry was posted in The Sunshine Factory and tagged Sugar, The Sunshine Factory by admin. Bookmark the permalink.